Y’all know I’m always looking for something to do with the twins! I’ve blogged about it in the past, like in my guide to fun activities to do with tiny people. Moving from crazy Atlanta to smaller Tuscaloosa, it can appear at first that there’s not as much to do with the family, but not true! Every weekend, there’s a great experience for the whole family happening here in town. 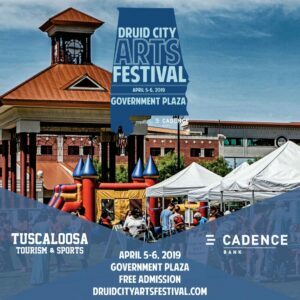 I’ve partnered with Tuscaloosa Tourism and Sports to share with you guys the FUN that’s coming up next weekend at the 2019 Druid City Arts Festival, April 5th & 6th at Government Plaza! This is the 10th annual DCAF, and I’m so excited to attend with the boys this year. They’re getting older now – just turned two – and more activities are possible to us this year. Before, I would have considered an arts festival to be a “date-day” activity for James and I. I never would have thought that there was so much kid stuff there, but it turns out, it’s an event for the whole family, and, best part – it’s FREE! Here’s some of the things I’m looking forward to doing with the twins at DCAF this year! I mean, the name in itself is adorable. Boy or girl, young or old – who doesn’t love puppies? Alex likes to look at them, point, and bark, but Nathan really gets hands on – he chases our friends’ puppy all around the house. I have a feeling they’re going to LOVE this part of DCAF (and I probably will too!) Plus, if you fall in love with a puppy you meet, you’re in luck! Puppies from the Metro Animal Shelter will be available for adoption that day. The Humane Society’s process isn’t quite so fast, but all puppies on site will be available for adoption. Schoolyard Roots is a Tuscaloosa non-profit organization that partners with local elementary schools to teach students about planting and gardening. Their goal is to “build healthier communities, engage students in learning, and increase access to healthy, sustainably-grown food.” What a great cause to support – and we get to do that at DCAF at their flower pot painting booth! Just getting a flower pot with the twins’ handprints will be an adorable keepsake, and a great opportunity for kiddos big and small to be creative. We’ve always been BIG friends of the library! Before I went back to work, Baby Storytime with Ms. Gwen was one of our mainstays. TPL has lots of great activities for kids year-round, so it’s no big surprise they’ve got one of the family-friendly activities at DCAF this year. Seeing the spin art machine in action will be exciting for my little guys, and I love getting to expose them to things they’ve never seen before. Even better, older kids will get the chance to expand their creativity and take it for a spin (pun intended) themselves. The teacher in me loves that this activity, provided by Left Hand Soap, is science in action! They’ll have a soap-making station where kids and adults alike can make their own delicious-smelling soap and take home the bar they make. Another fun, educational opportunity to get your kiddos away from the screens and out of their comfort zones! Plus, everyone’s been raving about Tuscaloosa’s own Left Hand Soap. I wouldn’t mind taking home a bar myself. Raise your hand if you’ve ever made a quilt with your kids before! Anyone? No? For kids, learning is more fun when your parents are learning alongside you. This is a cool, different way for you and your kids to learn something new together, work with your hands, and create lasting memories. Did I mention that all of that fun stuff up there is FREE? Plus, there will be lots of local food vendors to enjoy some yummy festival eats. I can’t wait to welcome spring with this fun event and I hope to see y’all there!